The Frederick Douglass- Isaac Myers Maritime Park is a Living Classrooms Foundation campus (and headquarters) and national heritage site that celebrates the contributions of African Americans in the development of Baltimore’s maritime industry. The site honors and interprets the city’s African- American maritime history, while preserving one of the city’s oldest existing waterfront industrial buildings. Are you looking for a fun experience that is informational and inspiring for your students or group? Perhaps you would like to plan a day of activities with the family? Visit the Frederick Douglass-Isaac Myers Maritime Park and Museum. The campus’s Frederick Douglass- Isaac Myers Maritime Museum is open to the public and chronicles the saga of Frederick Douglass’ life in Baltimore as an enslaved child and young man. We also take a look at the life of Isaac Myers, a free born African American who became a national leader. As a visitor, you will also learn about the founding of the Chesapeake Marine Railway and Dry Dock Company and the establishment of the African American Community in Baltimore during the 1800’s. Students/Teachers– Go beyond the textbooks and get a glimpse of what life was like 150 years ago while visiting the Douglass-Myers Maritime Park. Here, students learn, grow and experience the richness of African-American history in vivid detail. Students can also discover the challenges of the shipyard like Frederick Douglass did as a child. Come and be a part of African American history by visiting the Douglass-Myers Maritime Park. It will be an enlightening and inspiring experience for students of all ages. African-Americans– This site provides a unique opportunity for African-Americans to step back into the world of our ancestors. Come and connect with the diverse aspects of our beautiful heritage and culture. Here, you can learn how African American churches helped pioneer the education of children and adults and how they tied together economic and political forces. Learn about the daily life of African Americans. Take a voyage into our distinct past and journey with us as we re-live our bitter-sweet history. Interested in Maritime History? African Americans have long been involved in the trades. However, their stories remain untold. At the Douglass-Myers Maritime Park, you can uncover how African Americans worked on land to create a vital experience for those on water. Come and encounter the vibrant maritime history of African-Americans. Interested in Baltimore? The Douglass-Myers Maritime Park offers an insightful look at how the city developed around the maritime trades. At one point there were almost 20 shipyards in Fells Point. They employed thousands of people and this site explores and offers information about the only African-American owned and operated shipyard in the United States. February 1866 Meets with President Andrew Johnson to discuss black suffrage. Living Classrooms is proud to partner with the Baltimore National Heritage Area’s Urban Rangers as the exclusive guided tour provider at the Frederick Douglass Isaac Myers Maritime Park. For more information and to arrange a guided tour date for your school, family, or community group please call the Heritage Area office at (410) 878-6411 or inquire via email at sdaniels@baltimoreheritagearea.org. Minimum group size is 10. Visit the Baltimore National Heritage Area Website Here. Are you looking for the perfect venue for your wedding, reception, banquet, party or ceremony? Look no further. The Douglass Myers Museum provides the perfect space for your special occasion. 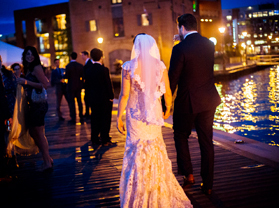 Nestled on the water, the museum’s breathtaking view and banquet rooms can be used to make your special occasion a success. For more information about Event Rentals please contact events@livingclassrooms.org.